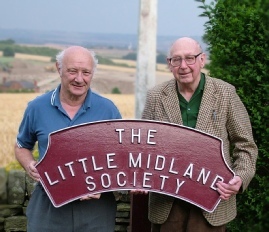 The Little Midland Society, Chesterfield was founded in early 1967 to cater for model railway and ‘real railway’ enthusiasts in and around the Chesterfield area. Two of the original members, Barry and Arthur. Whilst we have a great interest in model railways many of the membership are interested in full size railways, both standard and narrow gauge, covering preserved and everyday modern traction. In fact, we are interested in most things to do with railways! We have a unique meeting place on the outskirts of Chesterfield with meetings being held on most Monday and Friday evenings throughout the year. Details are available upon application. At present we have MODEL RAILWAY LAYOUTS IN FOUR DIFFERENT GAUGES: ‘O’; ‘OO’; ‘OO9’ and ‘N’. On meeting nights Members are able to work on the layouts to continually improve them. Members are also very welcome to run their own locomotives and rolling stock. Tea and other hot drinks are available at very reasonable prices on meeting nights. The ‘OO’ gauge layout is always available for Members to operate. Our ‘OO’ layout is one of the biggest in the county, taking up almost all of the upstairs of our meeting place. We have facilities for running analogue or DCC locos. Meanwhile downstairs there is a Museum of Railayana which has recently been refurbished. In this room there is a host of relics mainly from the “Steam Age” of our railways and includes many items of local interest. The Society produces a Members’ Newsletter – “The Little Midlander” – four times a year (Spring, Summer, Autumn and Winter). This publication is intended to keep Society Members up to date with Society happenings and local main line steam news. Members are invited to contribute to this Newsletter. During the year, generally between late April and September, the Society runs excursions to preserved railways, steam centres, museums and other places of interest. Our “Days Out” trips are popular and non-members are welcome to travel with us. Adult Society Members receive a discount on the quoted fares. (See separate link). NEW SOCIETY MEMBERS, whatever your interest in railways, are always welcome to join us. Please see the Contact Us link for more details or call into “WD Models” on Chatsworth Road, Chesterfield if you are in the area.